An ecosystem is a localized group of interdependent organisms together with the environment that they inhabit and depend on, such as a forest or a coral reef, and the physical parts of the environment that affect them. The term ecosystem was coined in 1935 by the British ecologist Sir Arthur George Tansley, who described natural systems as “constant interchange” among their living and nonliving parts. At the top of the hierarchy is the planet’s entire living environment, known as the biosphere. Within this biosphere are several large categories of living communities known as biomes that are usually characterized by their dominant vegetation, such as grasslands, tropical forests, or deserts. The biomes are in turn made up of ecosystems. The living, or biotic, parts of an ecosystem, such as the plants, animals, and bacteria found in soil, are known as a community. The physical surroundings, or abiotic components, such as the minerals found in the soil, are known as the environment or habitat. A division of the world’s vegetation that corresponds to a defined climate and is characterized by specific types of plants and animals, e.g. tropical rainforest or desert. Biome, also known as life zones, all plants, animals, and other organisms, as well as the physical environment in a particular area, form a biome. A biome is characterized by its plant life, the types of which are determined by a location’s climatic conditions, latitude, and altitude. The tropical rain forest is the most complex biome in the world. A biome is composed of many ecosystems—smaller communities of plants and animals and their habitats (the physical parts of their environment that affect them). Whereas the boundaries of a biome are determined by climate, the boundaries of ecosystems are physical features, such as ridges or riverbanks, that separate one community from another. The ecosystems of a particular biome tend to have plants with similar growth forms and animals with similar feeding habits. Major terrestrial biomes include tropical rain forest, northern coniferous forest, tundra, desert, grassland, savanna, and chaparral. Although not necessarily associated with marine environments, the term biome is sometimes used by ecologists to describe marine life zones such as the littoral zone, found in shallow water; the pelagic zone in the open ocean; and the benthic zone on the ocean floor. Climate Change is a measurable increase in the average temperature of Earth’s atmosphere, oceans, and landmasses. Scientists believe Earth is currently facing a period of rapid warming brought on by rising levels of heat-trapping gases, known as greenhouse gases, in the atmosphere. Greenhouse gases retain the radiant energy (heat) provided to Earth by the Sun in a process known as the greenhouse effect. Greenhouse gases occur naturally, and without them, the planet would be too cold to sustain life as we know it. Since the beginning of the Industrial Revolution in the mid-1700s, however, human activities have added more and more of these gases into the atmosphere. For example, levels of carbon dioxide, a powerful greenhouse gas, have risen by 35 percent since 1750, largely from the burning of fossil fuels such as coal, oil, and natural gas. With more greenhouse gases in the mix, the atmosphere acts like a thickening blanket and traps more heat. Earth’s atmosphere is primarily composed of nitrogen (78 percent) and oxygen (21 percent). These two most common atmospheric gases have chemical structures that restrict absorption of infrared energy. Only the few greenhouse gases, which make up less than 1 percent of the atmosphere, offer Earth any insulation. Greenhouse gases occur naturally or are manufactured. The most abundant naturally occurring greenhouse gas is water vapor, followed by carbon dioxide, methane, and nitrous oxide. Human-made chemicals that act as greenhouse gases include chlorofluorocarbons (CFCs), hydrochlorofluorocarbons (HCFCs), hydrofluorocarbons (HFCs), and perfluorocarbons (PFCs). Due to overwhelming scientific evidence and growing political interest, global warming is currently recognized as an important national and international issue. Since 1992 representatives from more than 160 countries have met regularly to discuss how to reduce worldwide greenhouse gas emissions. Surface temperatures in the Arctic have risen almost twice as much as the global average. Satellites have made continual observations of Arctic sea ice since 1978. The extent of Arctic sea ice has declined by about 8.5 percent per decade from its size in 1979 (top image). Since 2002 satellite records have revealed unusually early onsets of springtime melting in the areas north of Alaska and Siberia, as well as a smaller recovery of sea ice during the winter season. In 2005 (bottom image) satellites showed the lowest extent of Arctic sea ice on record. Earth’s zone of air, soil, and water that is capable of supporting life, traditionally thought of as a zone reaching about 10 km (about 6 mi) into the atmosphere and down to the deepest ocean floor is known to be as Biosphere. Life in this zone depends primarily on the Sun’s energy through photosynthesis, and on the circulation of heat and essential elements—most importantly the carbon cycle and the nitrogen cycle. A key feature of life on Earth is the production of oxygen by plants and other photosynthetic organisms that take in carbon dioxide. In turn, animals and other organisms use oxygen in the process called cellular respiration and release carbon dioxide. Earth’s biosphere has evolved over time. Primitive life is thought to have appeared on Earth by about 3.8 billion years ago. The earliest organisms may have been similar to archaea, one-celled organisms that can live without oxygen or sunlight. Over time, Earth’s atmosphere and ocean have undergone dramatic chemical changes. One of the most important events was the rise of oxygen produced by photosynthesis. Free oxygen in the atmosphere led to the formation of an ozone layer that protected Earth from deadly ultraviolet radiation, allowing organisms to live on land or at the surface of the ocean. Oxygen also allowed complex, multicellular life with high-energy metabolisms to evolve. The biosphere has remained sufficiently stable for hundreds of millions of years to sustain the evolution of today’s life forms. However, the history of life includes mass extinctions that have greatly reduced the number of species of plants and animals. Activity by humans has had major effects on parts of the modern biosphere. Global warming, pollution, deforestation, desertification, overfishing, soil erosion, and other human-caused changes to the environment can pose a threat to the diversity of life on Earth. Biosphere reserves have been established to help protect biodiversity. The role of an organism within its natural environment that determines its relations with other organisms and ensures its survival is the Ecological niche of that organism. Function of a particular species in an ecological community. In an ecological niche, every species occupies a unique position within its ecological community. The community provides the habitat—the place where particular plants or animals live. Within the habitat, organisms occupy different niches. A niche is the functional role of a species in a community—that is, its occupation, or how it earns its living. For example, the scarlet tanager lives in a deciduous forest habitat. Its niche, in part, is gleaning insects from the canopy foliage. The more a community is stratified, the more finely the habitat is divided into additional niches. Pollution is contamination of Earth’s environment with materials that interfere with human health, the quality of life, or the natural functioning of ecosystems (living organisms and their physical surroundings). There are two main categories of polluting materials or pollutants. Biodegradable pollutants are materials, such as sewage, that rapidly decompose by natural processes. These pollutants become a problem when added to the environment faster than they can decompose. Nondegradable pollutants such as dichlorodiphenyltrichloroethane (DDT), dioxins, polychlorinated biphenyls (PCBs), and radioactive materials are materials that either do not decompose or decompose slowly in the natural environment. Once contamination occurs, it is difficult or impossible to remove these pollutants from the environment. Pollution also has a dramatic effect on natural resources. Ecosystems such as forests, wetlands, coral reefs, and rivers perform many important services for Earth’s environment. They enhance water and air quality, provide habitat for plants and animals, and provide food and medicines. Any or all of these ecosystem functions may be impaired or destroyed by pollution. Moreover, because of the complex relationships among the many types of organisms and ecosystems, environmental contamination may have far-reaching consequences that are not immediately obvious or that are difficult to predict. For instance, scientists can only speculate on some of the potential impacts of the depletion of the ozone layer, the protective layer in the atmosphere that shields Earth from the Sun’s harmful ultraviolet rays. In addition to its effects on the economy, health, and natural resources, pollution has social implications. Research has shown that low-income populations and minorities do not receive the same protection from environmental contamination as do higher-income communities. Toxic waste incinerators, chemical plants, and solid waste dumps are often located in low-income communities because of a lack of organized, informed community involvement in municipal decision-making processes. A number of Word Organization and NGOs are working on the control of Pollution. Perhaps the most important step in this compass in the planting of trees which are the natural machines to control pollution. A rain that contains dilute acid derived from burning fossil fuels and that is potentially harmful to the environment. The problem begins with the production of sulfur dioxide and nitrogen oxides from the burning of fossil fuels, such as coal, natural gas, and oil, and from certain kinds of manufacturing. Sulfur dioxide and nitrogen oxides react with water and other chemicals in the air to form sulfuric acid, nitric acid, and other pollutants. These acid pollutants reach high into the atmosphere, travel with the wind for hundreds of miles, and eventually return to the ground by way of rain, snow, or fog, and as invisible “dry” forms. Damage from acid rain has been widespread in eastern North America and throughout Europe, and in Japan, China, and Southeast Asia. Makes lakes uninhabitable for fish and other wildlife. Acid pollution has one surprising effect that may be beneficial. Sulfates in the upper atmosphere reflect some sunlight out into space and thus tend to slow down global warming. Scientists believe that acid pollution may have delayed the onset of warming by several decades in the middle of the 20th century. Ozone Layer, a region of the atmosphere from 19 to 48 km (12 to 30 mi) above Earth’s surface. Ozone concentrations of up to 10 parts per million occur in the ozone layer. The ozone forms there by the action of sunlight on oxygen. This action has been taking place for many millions of years, but naturally occurring nitrogen compounds in the atmosphere apparently have kept the ozone concentration at a fairly stable level. 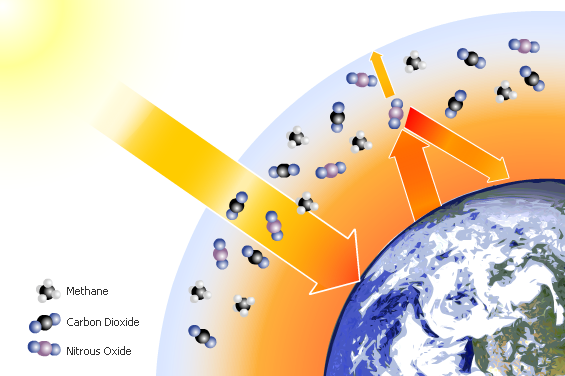 The ozone layer of the atmosphere protects life on Earth by absorbing harmful ultraviolet radiation from the Sun. If all the ultraviolet radiation given off by the Sun were allowed to reach the surface of Earth, most of the life on Earth’s surface would probably be destroyed. Short wavelengths of ultraviolet radiation, such as UV-A, B, and C, are damaging to the cell structure of living organisms. Fortunately, the ozone layer absorbs almost all of the short-wavelength ultraviolet radiation and much of the long-wavelength ultraviolet radiation given off by the Sun. FOOD CHAIN: Feeding relationships among organisms OR; a hierarchy of different living things, each of which feeds on the one below FOOD WEB: Set of interconnected food chains by which energy and materials circulate within an ecosystem. The food web is divided into two broad categories: the grazing web, which typically begins with green plants, algae, or photosynthesizing plankton, and the detrital web, which begins with organic debris. These webs are made up of individual food chains. In a grazing web, materials typically pass from plants to plant eaters (herbivores) to flesh eaters (carnivores). In a detrital web, materials pass from plant and animal matter to bacteria and fungi (decomposers), then to detrital feeders (detritivores), and then to their predators (carnivores). Generally, many interconnections exist within food webs. For example, the fungi that decompose matter in a detrital web may sprout mushrooms that are consumed by squirrels, mice, and deer in a grazing web. Robins are omnivores, that is, consumers of both plants and animals, and thus are in both detrital and grazing webs. Robins typically feed on earthworms, which are detritivores that feed upon decaying leaves. LATITUDE, which gives the location of a place north or south of the equator, is expressed by angular measurements ranging from 0° at the equator to 90° at the poles. LONGITUDE, the location of a place east or west of a north-south line called the prime meridian, is measured in angles ranging from 0° at the prime meridian to 180° at the International Date Line. Midway between the poles, the equator, a great circle, divides the earth into northern and southern hemispheres. Parallel to the equator and north and south of it are a succession of imaginary circles that become smaller and smaller the closer they are to the poles. This series of east-west-running circles, known as the parallels of latitude, is crossed at right angles by a series of half-circles extending north and south from one pole to the other, called the meridians of longitude. Degrees of latitude are equally spaced, but the slight flattening at the poles causes the length of a degree of latitude to vary from 110.57 km (68.70 mi) at the equator to 111.70 km (69.41 mi) at the poles. At the equator, meridians of longitude 1 degree apart are separated by a distance of 111.32 km (69.17 mi); at the poles, meridians converge. Each degree of latitude and longitude is divided into 60 minutes, and each minute divided into 60 seconds, thereby allowing the assignment of a precise numerical location to any place on earth. A long period of extremely dry weather when there is not enough rain for the successful growing of crops or the replenishment of water supplies is known to be as drought. The West African Sahel drought, which began in the late 1960s and lasted until the early 1980s, was the worst drought of the 20th century. The agriculture and livestock of much of Mauritania, Mali, Burkina Faso, Niger, and Chad were devastated, and the countries’ economies suffered. The term drought is applied to a period in which an unusual scarcity of rain causes a serious hydrological imbalance: Water-supply reservoirs empty, wells dry up, and crop damage ensues. The severity of the drought is gauged by the degree of moisture deficiency, its duration, and the size of the area affected. If the drought is brief, it is known as a dry spell or partial drought. A partial drought is usually defined as more than 14 days without appreciable precipitation, whereas a drought may last for years. Droughts tend to be more severe in some areas than in others. Catastrophic droughts generally occur at latitudes of about 15°-20°, in areas bordering the permanently arid regions of the world. Permanent aridity is a characteristic of those areas where warm, tropical air masses, in descending to earth, become hotter and drier. Although drought cannot be reliably predicted, certain precautions can be taken in drought-risk areas. These include construction of reservoirs to hold emergency water supplies, education to avoid overcropping and overgrazing, and programs to limit settlement in drought-prone areas. The atmosphere is the mixture of gases surrounding any celestial object that has a gravitational field strong enough to prevent the gases from escaping; especially the gaseous envelope of Earth. The principal constituents of the atmosphere of Earth are nitrogen (78 percent) and oxygen (21 percent). The atmospheric gases in the remaining 1 percent are argon (0.9 percent), carbon dioxide (0.03 percent), varying amounts of water vapor, and trace amounts of hydrogen, ozone, methane, carbon monoxide, helium, neon, krypton, and xenon. Without our atmosphere, there would be no life on Earth. A relatively thin envelope, the atmosphere consists of layers of gases that support life and provide protection from harmful radiation. Geographic Information System (GIS), computer system that records, stores, and analyzes information about the features that make up the earth’s surface. A GIS can generate two- or three-dimensional images of an area, showing such natural features as hills and rivers with artificial features such as roads and power lines. Scientists use GIS images as models, making precise measurements, gathering data, and testing ideas with the help of the computer. A Geographic Information System (GIS) is a computer system that synthesizes, analyzes, and displays many different types of geographic data in an understandable form. The GIS-generated image seen here shows the locations, represented by black dots, of industries releasing toxic chemicals in Los Angeles County. This image has been superimposed on census tracts—color-coded according to the distribution and size of different racial or ethnic groups in the area—from the United States Bureau of the Census. The green areas are inhabited mostly by Asians, the blue areas by blacks, the purple areas by Hispanics, and the yellow areas by non-Hispanic whites. The image was produced as part of a study carried out at the University of California in Santa Barbara to examine the relationships between pollution, race, and residential patterns. The image illustrates how a GIS can combine and clearly display many kinds of information for a given geographic area. Ok, Guys, the list is open to editing. Share latest Forest Ecology Terminologies / Short Term from Recent Papers in comments below so that the list could be updated. How Climate is Changing and How Underprepared We are as a Country? What are different types of aerial photographs? Relate them to different land uses in aerial inventory.